Rye Plantation Shutters from your local shutter specialists. Just Shutters provide quality Plantation Shutters and exceptional service, we do not compromise and all our shutters are lifetime guaranteed! Call us on 01892 575858. Rye is a beautiful small East Sussex town, a picture perfect location with homes from every era. Shutters and their bespoke nature compliment any home, from traditional to modern. Whether you are in a waterside location wanting to make the most of the stunning ambient light, or in the country wanting to maximise your view but retaining privacy and security – Just Shutters have the perfect solution. 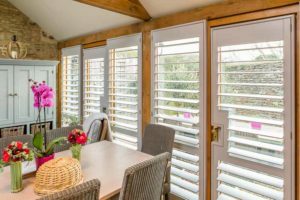 Our pure white or colourful shutters (colour matched to suit your exact requirements) are a perfect modern and fresh window covering, while our wonderful woods add traditional elegance and warm style to your interior. Make the most of the stunning Rye location and bring the outside in, whether it’s those bright crisp country mornings, or the evening sunset ambiance, shutters allow you flexibility in having privacy, security and light – angle the shutters to flood in light, or for maximum shade, open fully, or close to almost black out – shutters offer not just style, but a fantastically practical solution, above and beyond any other window dressing on the market. Please see our range of shutter images for inspiration. Rye shutters expert David is on hand to answer any questions you may have, Are shutters made to measure? Yes. Are plantation shutters the same as plantation blinds? Yes. Are shutters right for me? We think so, let us come to you with no obligation, so we can show you exactly what we can do for your home. Call now on 01892 575858 request a shutters brochure, or email us to find out more about Just Shutters and why we have over (7000) satisfied customers.